Everywhere around you, a craze for smartphones is prevailing. Smartphones are replacing clocks, watches, calendars, scrap books and many other objects of daily use at a very rapid pace. App developers are trying to bridge this transition from old fashioned objects to the 5 inch screen that you carry around in your pocket all the time. One such effort is being done at Vaeren Labs. 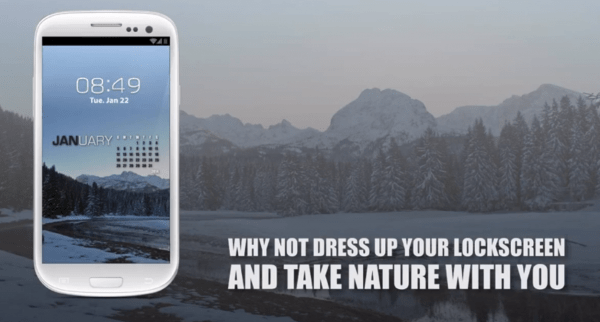 Their developer, Verdin has introduced an app that puts your calendar on your unlock screen. For the time being its just a JPG image of a calendar that gives you the feel of a calendar hanging on your wall without unlocking the phone. Verdin has developed this app for the last 3 iPhones (4/4s/5) and Galaxy S3. Unlock your phone by tapping on a combination of dates or swiping a pre-defined pattern on the calendar. Access the call logs of a specific date by tapping it. Access the pictures and videos shot on a particular day by one quick touch on the date. Access your appointments and tasks for a given date.